The year 1997 was right in the middle of the golden age of 90's hip-hop that many people have decided is one of the best two eras in hip-hop history, the other being the previous late 80's era. 1997 was the year after the murder of Tupac Shakur and saw hip-hop lose the East Coasts biggest artist Biggie aka Notorious BIG in gun violence in March of that year. In the beginning of July, Bad Boy founder Sean Puff Daddy Combs released his first label compilation where he served as the headliner, in the first release (other than Biggies own album) after the death of his friend and artist. You have to wonder what additional changes would have come if Big was there to finish. 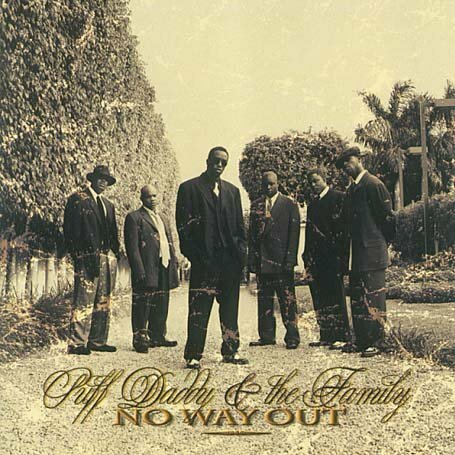 This week, the Throwback Thursday album review belongs the "No Way Out" by Puff Daddy and the Family as they were known at the time. The album starts with the classic BIG verses on Victory which feature his pre verse talking and Puff's small introductions to the massive verses from the Notorious One. This is one of the true memorable beats and raps of the era as it brings in the album with the voice hip-hop would come to miss. The hook provided by Busta Rhymes always leads me to believe there are bars out there from Busta on this track. This is followed up by a more upbeat track that probably was destined to feature a verse from BIG as he is on the hook of the song which the new Bad Boy star Mase and Puff traded verses on what would be the second single from the album. The thing you can tell on this album is Puff isn't truly comfortable with being an artist himself at this point. "What are you gonna do?' for example, he struggles mightily on. "Do You Know" which is an introspective track inluenced by the loss of Biggie is a decent song but Puff doesn't really have his flow together. "Young G's" has him reciting a verse that sounds like it was written by feature artist Jay-Z and seems to fit more with Puffs abilities. The song is brought to a close with a verse by Biggie which sums up the song quite nicely. Black Rob came through with his simple but effective story telling for the first time on "I Love You Baby" before leading into another classic track and song "All About the Benjamins" which we all bumped so heavy back in those days. This song still knocks today. I do question sequencing and following the Benjamins with the puff solo "Pain" which while it has depth, again has Puff struggling to work with the beat before going into something more mellow and smooth which features Twista who kills "This is The End". There is some filler type tracks like the wanna be single that features Lil Kim "Don't You Stop" and another failed old soul sample "Friend". I don't like the sound of "I Got The Power" at all. "I'll be missing you" really should end off the album but I think I get the thematic reasons for ending with the first single "Can't Nobody Hold Me Down" which is hilarious as it doesn't seem anywhere near melodic enough to power an album's release. This is a bright spot and the thing is when you go back you remember all the songs you never really listened to and have to bring down the album grade. If those four or five didn't exist this would be a perfect record, but as it is 4 of the 17 tracks should have gone to the mix tape circuit and not the actual realease, dropping the grade down some.